To people who say they could give up bread, I say toasties. I say pulled pork toasties, mac & cheese toasties and even plain old (but equally as delicious) ham and cheese toasties. There is no one who can truthfully say they don’t get excited by all that melty cheese and crispy bread. These bad boys are basically happiness in food form. 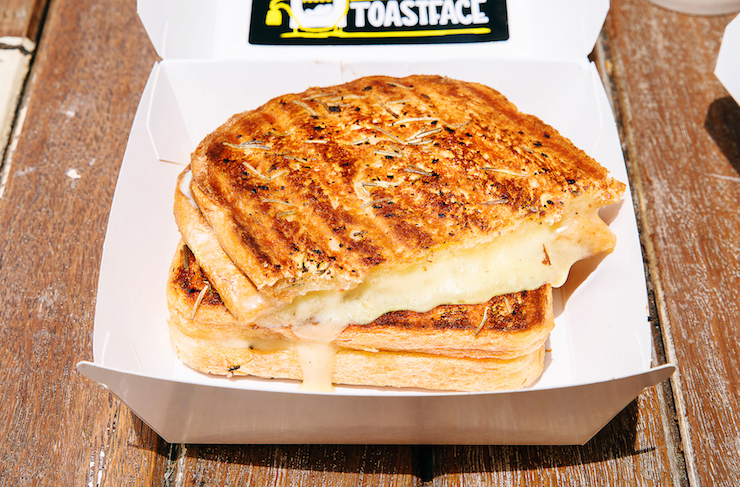 So we’ve done the tough research for you and rounded up Perth’s best toasties with the mosties! 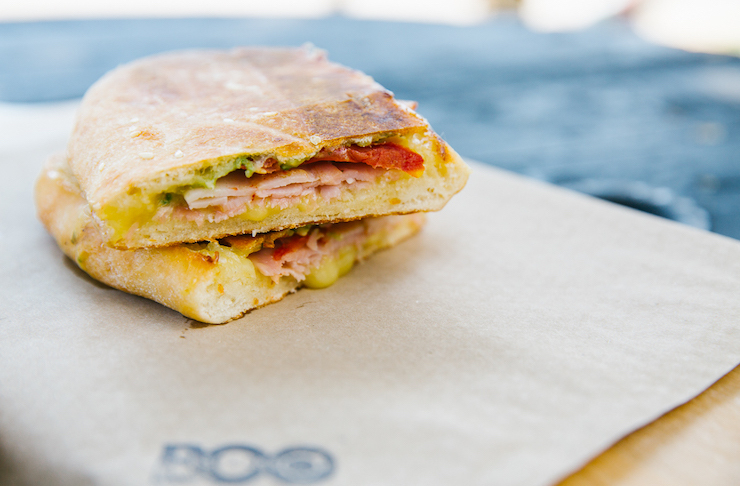 If you want a fancy pants toastie, look no further than Toastface Grillah’s Danny Zuccho—brie cheese, prosciutto and zucchini—or their Pear Grillz—blue cheese, pear and lime chutney. If you’re not into the fancy stuff you can get a good old ham and cheese toastie or, for the true blue Aussies, a vegemite and cheese one. So. Many. Jaffles. You’re going to want them all. But if you have to choose just one, I’d pick the green machine filled with avocado, spinach, pesto and feta. The best part? All their toasties are served up with corn chips and pickles! Mac & cheese. Inside a toastie. Yeh they did. If that doesn’t tickle your fancy (what is wrong with you?) then you couldn’t possibly say no to the pulled pork toastie which will seriously knock your socks off. Plenty of Flo’s toasties have kimchi in them and so are basically healthy, right? They are also full of delicious cheese and all the other best things like pulled pork so maybe they aren’t that healthy. But it doesn’t matter because they are THAT good. Toasted brioche filled with king oyster mushroom with caramelised onion and camembert? Or how about the crayfish with semi dried tomato, dill and salmon roe mayo? These are seriously fancy jaffles and it doesn’t really matter what you choose because they are all amazing. The Toastery has got everything from the classics like ham and triple cheese or Vegemite and cheese to their Seven Samurai—miso buttered corn, roast chicken, triple cheese and sriracha mayo. Yum. They also whip up classic American milkshakes and thickshakes, as well as a dessert toastie that will blow your mind. 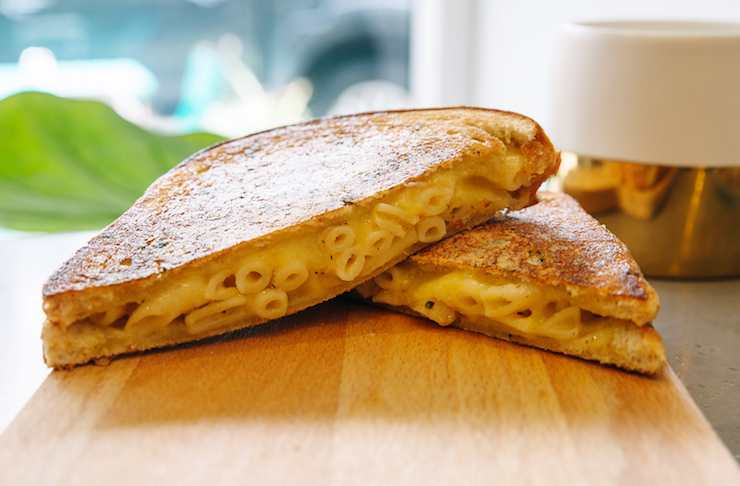 With a name like Grilled To The Mac you already know they have mastered the mac & cheese toasties. But these clever kids also do delish Ruebens and Cubanos that will make you feel like you’re in North America, the land of comfort food. Did you know Perth is home to the world's first (and only) curry toasties? You can go for the traditional curry toastie, or up the ante with a nasstie—a naan bread toastie! Yep, it's just as good as it sounds. Plus, for every toastie you buy, Toast My Curry donates a meal through their curry4curry program to help motivate kids in Mumbai to continue their education. BOO Espresso do toasties to perfection and you’d do well to get down there and check out their dessert toastie filled with Nutella, mascarpone and raspberries. They also have a toastie with guacamole in it so they win at life. 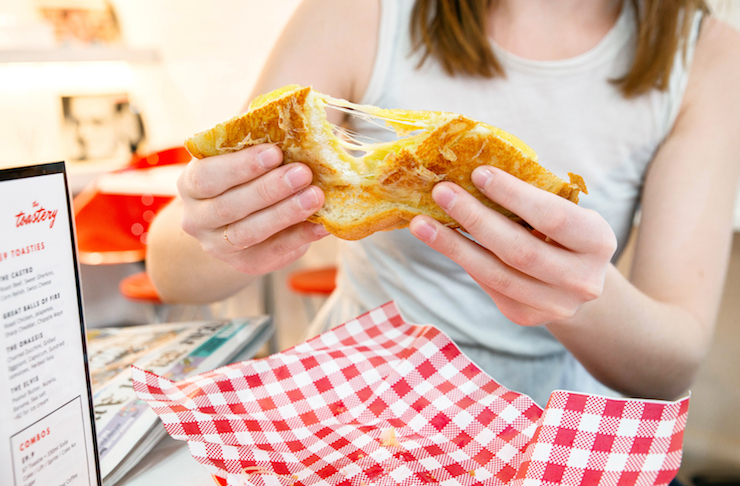 How do you say no to a toastie named the Slam ‘n’ cheese? Or the Mac Daddy—homemade mac & cheese with a parmesan crust? The correct answer is you don’t. If you’re feeling really indulgent try the Stanley which is filled with Nutella and banana. These are definitely some of Perth's best toasties! Turns out that crumpet guy also does a mean Rueben sanga. If you can find this place (and you should) then you need to try one of the toasted sandwiches. If the Rueben doesn’t get you all excited, you can opt for the Freo Ploughman, slow cooked chicken or a pretty amazing sounding vego option with fermented beetroot and chargrilled broccoli. These guys figured out the perfect cheese to bread to whatever-other-less-important-ingredients-you-put-in-a-toasted-sandwich ratio and basically nailed it. Order one of these and an epic coffee and you too can feel like you have nailed life. There’s something about a good jaffle that you just can’t beat. 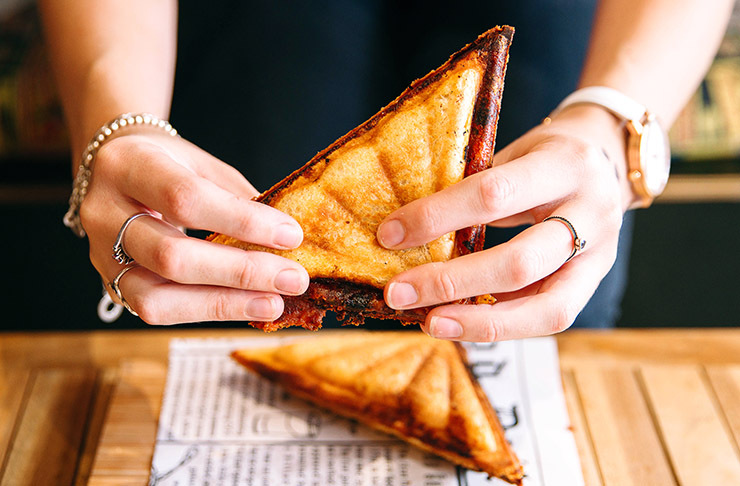 Old Boy Cafe is dishing up lasagne toasties, vegemite toasties, brekky toasties and more, and they are all dang delicious. Oxford Yard does the classics and they do them well. Chicken, cheese and avocado is always the best, or if you’re in need of some extra veg, nothing beats pumpkin, pesto and feta. You all know how good the bread is at Bread In Common, so it’s only fitting that these guys whip up some of Perth's best toasties—so good they'll make you feel genuinely sad for people who can’t eat bread. Or cheese. Life just isn’t fair. More for us I guess? Younger sibling to Perth toastie masters Toastface Grillah, Lil' Toastface is dishing out the same amazing toasties from the teeniest space on William Street in Northbridge. They also do a killer coffee and some epic sweet treats. Want more carby goodness? Check out Who's Making Perth's Best Sambos.